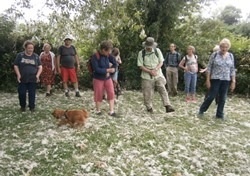 Remember to set the time aside to join us for nine days of glorious summer walking next year. We had a real programme with a difference this year. Lots of ‘good walks’ over beautiful countryside interleaved with a cycle ride, the twenty-miler through South Herefordshire, the chance to learn & practise map reading skills in real time with guidance on hand, ‘walking art’ explained by Jess Allen, walking through ancient woodland with poet Jean Atkin from the Ledbury Poetry Festival. 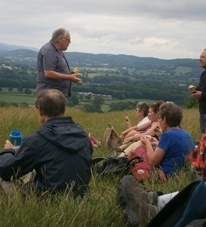 Phil Rickman, creator of Merrily Watkins, Advisor on the Paranormal, in the Herefordshire borderlands, led a walk around Hereford discussing the locations from the books. Kentchurch Court opened its gardens; ancient & modern cider orchards plus a Cider Museum tour; walks around Croft Castle with a private tour of the walled garden; turnpike roads, drovers’ roads, a Roman road. Storytelling while walking through old estates; the ancient landscapes explained by a geologist or through an app on smartphone or tablet that helped us observe the rocks encountered en route; a cider tribute to the Solstice. It was hard work fitting it all in. We can't guarantee the weather but look forward to welcoming everyone to discover the lovely countryside, delicious food and the friendly companionship that Herefordshire has to offer. This walk ticked all our boxes! Afternoon, 3-4 miles, mixed terrain, interesting sights. Excellent guides plus tea & cakes after walk. V. good. Interesting, informative, variety of terrain. Excellent leaders delivering knowledge with fact & humour. Stunning countryside, sunshine & scheduled breaks pinpointing the most dropping views & venues.